We're pleased to be the first to bring you the trailer for Jake Goldberger's darkly comic thriller, Don McKay today. The film was a hit at this year's Tribeca Film Festival and stars a pretty stellar cast headed up by Thomas Haden Church and Elisabeth Shue (man, haven't seen her in a while). Personally I like these kinds of small town, nothing-is-as-it-seems thrillers and I can't wait to check it out. Twenty-five years after abandoning his hometown, Don McKay (Thomas Haden Church) gets a letter from his ex-girlfriend (Elisabeth Shue) saying that she is dying and wants him to come see her. When Don returns home, Sonny doesn't seem quite like he remembers her and everything seems a little bit off. In this darkly comic debut thriller, MOMENT OF TRUTH, writer/director Jake Goldberger tells a story where no one is who they seem and everyone appears to be hiding something. 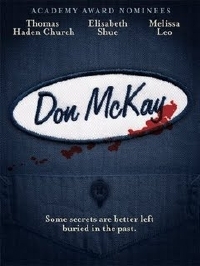 Don McKay also stars Melissa Leo, James Rebhorn, M. Emmet Walsh, Pruitt Taylor Vince and Keith David. Watch an extended clip from the film here. Sorry gang, we've been asked to remove the trailer until it's made official. With any luck we'll be seeing more from this film soon.